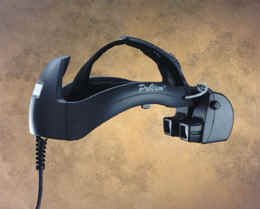 The XL50 is the newest addition to the ProView family of head-mounted displays. It features full-color XGA performance for those demanding tasks that require ultra-high resolution stereo imagery. The ProView XL50 incorporates Kaiser Electro-Optics (KEO) proprietary technology to achieve unparalleled color performance and high contrast ratio. The expanded color gamut really sets it apart from other display systems. The optical modules are mounted on the same comfort-fit headband system used on all ProView HMDs. Copyright © 2006 Mindflux (Jasandre Pty. Ltd.). All rights reserved.